On November 2, 2017, Journal of Palestine Studies Editor and IPS Senior Fellow Rashid Khalidi delivered a lecture on the centenary of the Balfour Declaration at the United Nations’ Committee on the Exercise of the Inalienable Rights of the Palestine People. The event brought bring together a broad range of participants, including members of the diplomatic community in New York, UN staff members, representatives of civil society organizations and the general public. The following is the full text of Khalidi’s remarks. It is a great honor to be asked to speak here on the 100th anniversary of the Balfour Declaration. I am grateful to Ambassador Fodé Seck, to the Committee on the Exercise of the Inalienable Rights of the Palestinian People, and to the staff of the UN Secretariat for making this event possible. It is particularly fitting to be speaking today at the United Nations, which has played such a large role in the Palestine tragedy. Today I will be addressing the impact on the Palestinian people of the Balfour Declaration, and of the League of Nations mandate based upon it. I can only hope that if we can all become more aware of this historical background, the United Nations may be able to address the harm caused by this Declaration, and all that followed, more fairly and effectively than it has done over the past 70 years. The momentous statement made on behalf of the British cabinet on November 2, 1917 by Arthur James Balfour, His Majesty’s Secretary of State for Foreign Affairs, is usually regarded in light of British imperial interests, or in terms of its ostensible subject, a “national home for the Jewish people.” We know a great deal about Britain’s commitment to Zionism. We know less about what the support of the British Empire via this declaration meant for the aims of the Zionist movement – which for nearly half a century proudly described itself as a colonial endeavor, and which at the same time was a national movement in the making. The ultimate objective of political Zionism, as laid out by its founder, Theodor Herzl, in his 1896 booklet Der Judenstaadt, was as far-reaching as it was crystal clear: a Jewish state in Palestine, meaning Jewish sovereignty and control of immigration into the country. And whatever Britain may have intended, complete and exclusive control over the entirety of Palestine was what the Zionist movement consistently fought for during the ensuing half century, and eventually obtained. It did so largely as a result of over two decades of unstinting British support secured via this Declaration, and the League of Nations mandate that was based upon it. Much of this is well known. 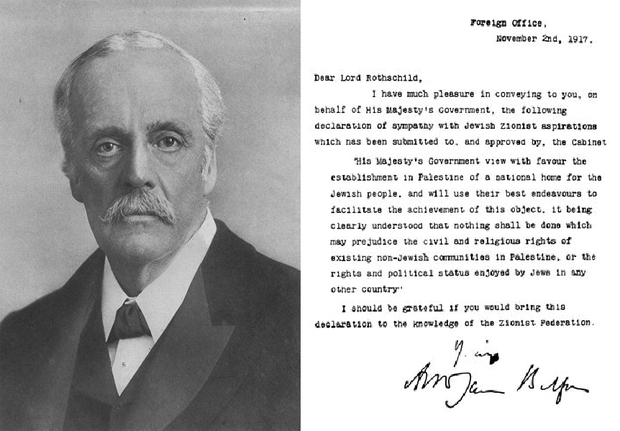 However, the Balfour Declaration has another aspect of paramount importance that is often ignored. This was the perspective of the people of Palestine, whose future the Balfour Declaration ultimately decided. For the Palestinians, this statement was a gun pointed directly at their heads, particularly in view of the colonialist ambiance of the early twentieth century. As I will show, the Balfour Declaration in effect constituted a declaration of war by the British Empire on the indigenous population of the land it was promising to the Jewish people as a National Home. 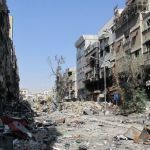 It launched what has become a century-long assault on the Palestinian people aimed at implanting and fostering this national home at their expense. From its inception, Zionism was bot h a nascent national movement and a colonial enterprise in search of a metropolitan sponsor. After having failed to find that sponsor elsewhere, Chaim Weizmann succeeded with the wartime British cabinet. The Zionist movement thereafter had the support of the greatest power of the age, which was about to become one of the victors in World War I. Whereas Zionism had begun to be viewed with concern in Palestine since the late 19th century, the Balfour Declaration meant that the country was now threatened by a far greater danger. Indeed, at the very moment that the declaration was issued, British troops were advancing northwards through Palestine, capturing Jerusalem five weeks later. The overwhelming Arab majority in Palestine (which then constituted around 94% of the population) went unmentioned by Balfour, except in a backhanded way: as the “existing non-Jewish communities in Palestine.” They were not described as a people – notably, the words “Palestinian” and “Arab” do not appear in the text of the Declaration. Furthermore, they were offered only “civil and religious rights,” and no political or national rights whatsoever. By way of contrast, Balfour ascribed national rights to “the Jewish people,” who in 1917 were represented in Palestine by a tiny 6 percent of the total population. 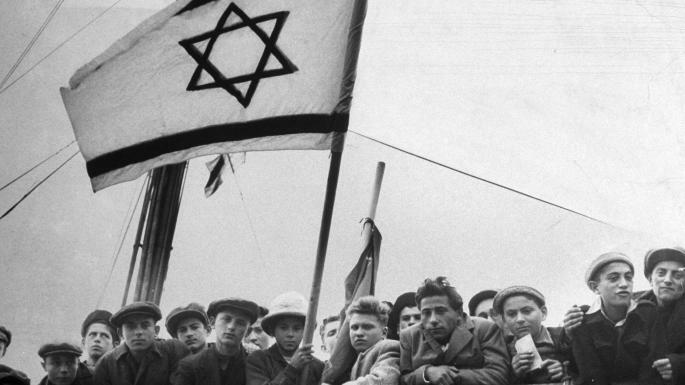 Regarded in this way, Britain’s backing for Herzl’s aims of Jewish statehood, sovereignty, and control over immigration into the country had portentous implications. It meant British support for bringing into Palestine and implanting a foreign majority at the expense of the indigenous population’s rights, and ultimately at the expense of its existence as a people in its own land. The Balfour Declaration thus meant that the Palestinians faced the prospect of being outnumbered by unlimited immigration, and of losing control of Palestine to the Zionist drive for sole sovereignty over a country that was then almost completely Arab in population and culture. 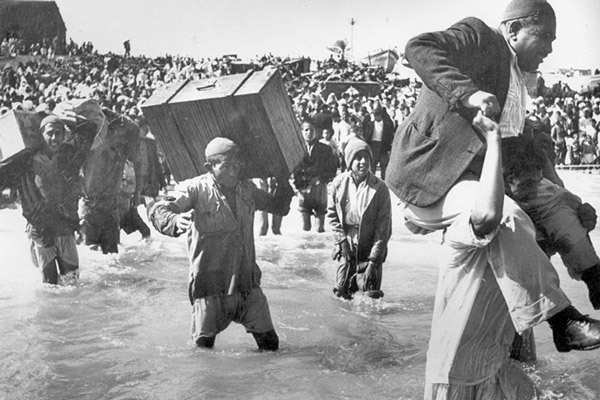 It took just over three decades, and the mass expulsion of most of the Arabs of Palestine from their homes in 1948, for these things to happen, but happen they did. Even before World War I, there had been trepidation among the Arabs of Palestine about the rapid progress of the Zionist movement. This became a widespread sentiment as the movement grew in strength and as immigration to Palestine increased: between 1909 and 1914, the leading Haifa and Jaffa newspapers, al-Karmil and Filastin, published over two hundred articles warning against the dangers of Zionism for the Palestinians. Among the peasantry in areas of intensive colonization, Zionist inroads were felt in concrete terms, as land purchase led to the removal of Arab peasants working the land. Their concerns were shared by Arab city dwellers, who observed with mounting concern the constant arrival of new European Jewish immigrants. News of the Balfour Declaration reached Palestine only with much delay after November 2, 1917. All local newspapers had been shuttered since the beginning of the war. Then, after British troops occupied Jerusalem in December 1917, the strict military occupation regime banned news of the declaration from being spread, and did not allow papers to reopen for two year. There were other reasons for the delayed Palestinian reaction to the Balfour Declaration. 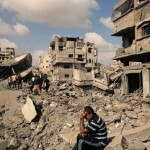 They relate to the extraordinary wartime conditions that prevailed in Palestine and that caused intense suffering. The country was the scene of a more than a year of grinding battles between British and Ottoman forces which continued until mid-1918. By the war’s end, the Palestinians were already prostrate and exhausted by severe wartime shortages, penury, dislocation and famine, the requisitioning of draft animals, a plague of locusts, and draconian conscription that sent most working-age men to the front. Of all the major combatant powers, the Ottoman Empire suffered the heaviest wartime death toll, with over three million war dead, or 15% of the total population, most of them civilians. Greater Syria, including Palestine, suffered half a million deaths due to famine alone between 1915 and 1918. Civilian deaths were compounded by horrific war casualties: 750,000 Ottoman soldiers out of the 2.8 million mobilized died during the war. The impact of all these factors on Palestine was intense. It is estimated that after growing about 1 percent annually in the prewar years, Palestine’s population declined by 6 percent during World War I. It was against this grim background of mass suffering and the advance of the British army that Palestinians eventually learned about the issuance of the Balfour Declaration. The shock of hearing about it was exacerbated by a British occupation that marked the end of 400 years of Ottoman sovereignty, a regime which had prevailed for a full twenty generations. There was nevertheless a rapid evolution in the way the Palestinians saw themselves during and after World War I. In a world where nationalism had been gaining ground for many decades, a world war driven largely by unrestrained nationalist sentiment provided a major boost to the national idea in Palestine and other parts of the world. The enhanced salience of nationalism was compounded by the espousal in 1917 by Woodrow Wilson and Vladimir Lenin of the principle of national self-determination. The endorsement of the national principle by two ostensibly anti-colonial powers had an enormous impact on peoples the world over. As a result of the hopes aroused, and later disappointed, by Wilson’s Fourteen Points, the Bolshevik Revolution, and the Paris peace conference, India, Egypt, Korea and many other countries witnessed massive anti-colonial upheavals. As a result of the war, the Palestinians were suffering from what might be described as collective post-traumatic stress syndrome. They now had to face entirely new realities as they entered a post-war world suffused by nationalist fervor. The Ottoman Empire was gone, replaced by the hegemony of Britain and France, which in 1915-16 had secretly carried out a self-interested colonial partition of the region — the Sykes-Picot accords — that was publicly revealed in 1917. Against this could be set the possibilities of Arab independence and self-determination, promised secretly by Great Britain to Sharif Husayn of Mecca in 1916, and the subject of repeated public British pledges thereafter. While these promises were at best partially and belatedly kept as regards other Arab peoples, they were never honored where the Arab population of Palestine was concerned. So while other Middle Eastern countries eventually achieved a measure of independence, no such option was on offer for the Palestinians. In Palestine, Great Britain operated with a different set of rules than in other League of Nations mandates. Unlike all the other class A mandates established in the former Arab provinces of the Ottoman Empire, all of which were treated according to Article 22 of the Covenant of the League of Nations as provisionally “independent nations,” Palestine was denied such treatment. Instead it faced a set of rules rigidly dictated by the terms of the Balfour Declaration. And the Declaration had been tailored to suit the desiderata of Zionism, a European colonizing project and a national movement which had now acquired as its patron a formidable empire whose armies were just then in the process of conquering Palestine. British troops were not to leave the country for over thirty years, by which time the Zionist enterprise had become firmly entrenched. As soon as they were able to do so in the wake of World War I, the Palestinians began to challenge vigorously both the form of governance imposed by the British, based on the Balfour Declaration, and the introduction of the Zionist movement as a privileged interlocutor of the British. They did so initially in the shadow of a strict British military occupation regime that lasted until 1920, followed by rule by a series of British High Commissioners. The first of them was Sir Herbert Samuel, a committed Zionist and former cabinet minister, who laid the governmental foundations for much followed. In understanding the unsuccessful efforts of the Palestinians to oppose this regime, two crucial factors are of paramount importance. The first is that unlike most other peoples who fell under the sway of colonial rule, the Palestinians had to contend not only with the colonial power in the metropole but also with the terms of the Balfour Declaration. Thus they had to deal with a colonial settler movement which, while beholden to Britain, was independent of it and had a powerful national impulse and an international base, most importantly in the United States. The second is that Britain did not rule Palestine outright: it did so as a mandatory power of the League of Nations. In rejecting Palestinian protests about the Balfour Declaration, British officials could point to the international legitimacy for its terms provided by the 1922 League of Nations Mandate for Palestine, which, at the instigation of the British themselves, had incorporated verbatim the text of the Balfour Declaration, and in 7 of its 28 articles, substantially amplified and expanded on its commitments. Thus the British government could hide behind the terms of their League of Nations mandate in denying the Palestinians treatment as an “independent nation” in accordance with Article 22 of the Covenant. 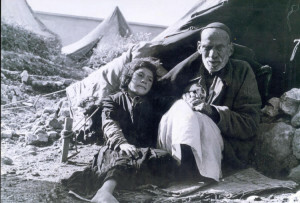 The Palestinians were therefore in a triple bind, which may have been unique in the history of resistance of indigenous peoples to European colonialism. They faced the might of the British Empire in the era between the two world wars when not one single colonial possession, with the partial exception of Ireland, succeeded in freeing itself from the clutches of the European imperial powers. They faced as well an international colonizing movement with a national mission, and with its own independent sources of finance and support, besides those generously offered by Britain. And finally they were confronted with the international legitimacy accorded to British rule by the League of Nations, which had sanctified the Balfour Declaration and its colonial import for the Palestinians by endowing it with the legal imprimatur of the preeminent international body of the day. 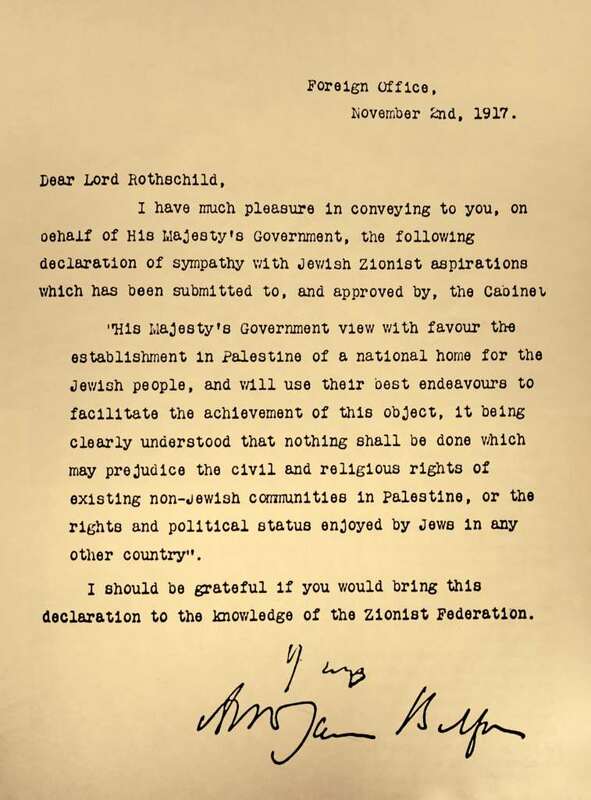 The Balfour Declaration thus became more than a statement by the British cabinet: it was an internationally sanctioned legal document. In explaining the failure of the Palestinians to retain control of their ancestral homeland, alongside understanding the shortcomings of their leaders and the hindrances resulting from fissures within their society, it is vital to keep in mind this triple bind they were in. Before November 2, 1917, the Zionist movement was both a national movement in embryo, and a colonial enterprise without a fixed metropole, like an orphan searching for a foster parent. When it found one in Great Britain, as symbolized by the Balfour Declaration, the colonization and transformation of Arab Palestine into a Jewish state could begin in earnest. This process was backed soon afterwards by the international legitimacy provided by the League of Nations. It was backed as well by an indispensable “iron wall” of British bayonets, in the words of that most forthright of Zionist leaders, Ze’ev Jabotinsky. Seen from the perspective of the Palestinian people, the careful, calibrated prose of the Declaration amounted to a proclamation of war on them. For the next few decades, this war was waged by the Zionist movement with money, legal means, propaganda, and mortars and car bombs, and by the British Empire with multiple forms of repression, prison camps, exile, summary executions, warplanes, tanks and artillery. The issuance of the Balfour Declaration thus marked the beginning of a century-long colonial conflict in Palestine, supported by an array of outside powers. In much different forms, this conflict continues until this day. I realize that I have imposed on your patience by summarizing some of the history around the Balfour Declaration. 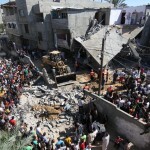 Some say that we should forget history in dealing with the Palestine conflict. Those who say this, however, have an absolutely miserable track record of failure in attempting to resolve the core issue at stake: the conflict between the Palestinian and Israeli peoples. In fact, this historical background is essential to understanding why this conflict has lasted for so long, and to its just resolution. It also helps us to understand that it did not begin in 1967 or 1948, as some shortsighted observers would have it. Finally, it points out the avenue towards a real lasting, sustainable peace, and towards real reconciliation and compromise between the Palestinian and Israeli peoples. Genuine reconciliation depends on acknowledging historical realities rather than ignoring them. And genuine compromise must be based on justice and absolutely equal treatment, and absolutely equal rights, for all, not on the imposition of the will of the stronger on the weaker. That is not compromise. This historical background points to another fact. This is that peace between Palestine and Israel is far too important to be left to the self-interested ministrations of the great powers alone. Again and again, the history of the League Nations and the United Nations shows us that these great powers were responsible for imposing formulas in Palestine that suited their interests of the moment. In every single case these formulas exacerbated and magnified this conflict. In so doing, these great powers have ignored international law, and essential elements of the covenants and charters they themselves helped to shape, such as the principle of self-determination that animates both the Covenant of the League of Nations and the Charter of the United Nations. As the son of an international civil servant who served the United Nations for his entire career, I have been a close witness for decades to the failure of this body to live up to its principles where Palestine is concerned, largely because of the machinations of the great powers. I am not naïve, however, and as a historian I know all too well that power has its prerogatives. But the United Nations was not set up to make the world a more comfortable place for the powerful, but rather to bring about peace with justice, and the rule of international law. Over the hundred years since the Balfour Declaration was issued, the 70 years since the passing of the Partition resolution, and the fifty years since the adoption of UNSC 242, neither peace with justice nor the rule of law has prevailed where Palestine is concerned. It is high time for the United Nations and the entire world community to act in this spirit. Specifically, after a century, it is high time that the establishment of a national home promised by Balfour and the League of Nations to the Jewish people in 1917 and afterwards be matched by the establishment of a national home for the Palestinian people. After 70 years, it is high time that the national self-determination promised to the Israeli people by the UN in 1947, and that they have enjoyed since 1948, be enjoyed by the Palestinian people. And after 50 years, it is high time for the injunction in UNSC 242 forbidding “the acquisition of territory by war” to be vigorously enforced where the territories occupied in 1967 are concerned. Finally, it is high time for the United Nations and the entire international community to take vigorous action to break the century-old logjam created and perpetuated by the great powers. 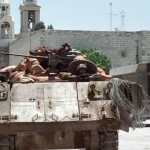 This man-made logjam has prevented the principles of self-determination from being applied fairly and equally to both parties to this conflict, the Palestinian and the Israeli peoples. They both deserve the peace and stability that an equitable resolution of the conflict between them on the basis of international law and in a spirit of justice and equality would bring. 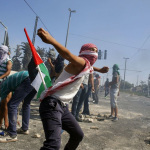 Who is leading the Intifada?